"Keeping you in our thoughts and prayers"
"I love you Great Aunt (Grandma) Geneva! You will always be in my heart! " "She was my mother, and oh what a mother was she. I will miss her every day for the rest of my life"
"Loved you and you will truly be missed. So sorry for your loss." "We will miss you greatly but hold all our memories in our hearts. We love you always." Geneva Louise Ballew, 94, of Weaverville, NC, passed away November 4, 2018 at CarePartners Solace Center. Mrs. Ballew was born March 1, 1924 in Buncombe County to the late Stephen Wheeler and Connie Mae Lindsey Ballew. She was a member of Union Valley Freewill Baptist Church and retired from Vanderbilt Shirt Company. In addition to her parents, she is preceded in death by eight brothers and sisters, Paul, William, Fred, Earl and Jack Ballew, Elizabeth Ducker, Frances Fortner, and Eva Mae Hunter. Geneva is survived by her son, Danny “Butch” Smeltzer (Elaine) of Nantahala Gorge; grandchildren, Sonny, Amanda (Bryan), and Becky; great grandchildren, Brooke, Blake, and Reece; and numerous nieces and nephews. The family will receive friends Monday, November 12, 2018 from 10:30am to 12:00 pm at Harwood Home for Funerals with a celebration of life service immediately following with Rev. Darrell Roberts and Bud Lewis officiating. Burial will be in Green Hills Cemetery. The family would like to extend a special thanks to the staff of Emerald Ridge Care Center. 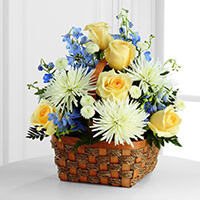 To send flowers to the family of Geneva Louise Ballew, please visit our Heartfelt Sympathies Store. We encourage you to share any memorable photos or stories about Geneva. All tributes placed on and purchased through this memorial website will remain on in perpetuity for future generations. I am so sorry to hear of Geneva’s passing. She was a such a sweet lady. I loved visiting with her and Granny Harmon at the nursing home. They loved one another very much. Thank the Lord in heaven they will no longer be sick in body and mind. Our prayers for the family. I love you Great Aunt (Grandma) Geneva! You will always be in my heart! Loved you and you will truly be missed. So sorry for your loss. We will miss you greatly but hold all our memories in our hearts. We love you always.